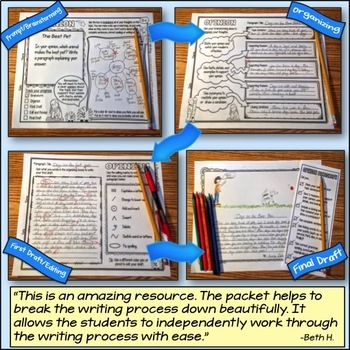 One of the nice things about task cards is that they can be used without a lot of preparation or planning as a filler activity, at centers, or when you have a sub. Those activities can be real lifesavers (especially when you are having one of those weeks), but by taking a more intentional approach, you can use task cards for so much more. You’ve probably noticed that task cards come in several different varieties – multiple choice, short answer, discussion prompt, etc. Depending on the lesson you are planning, one format may work better than another. 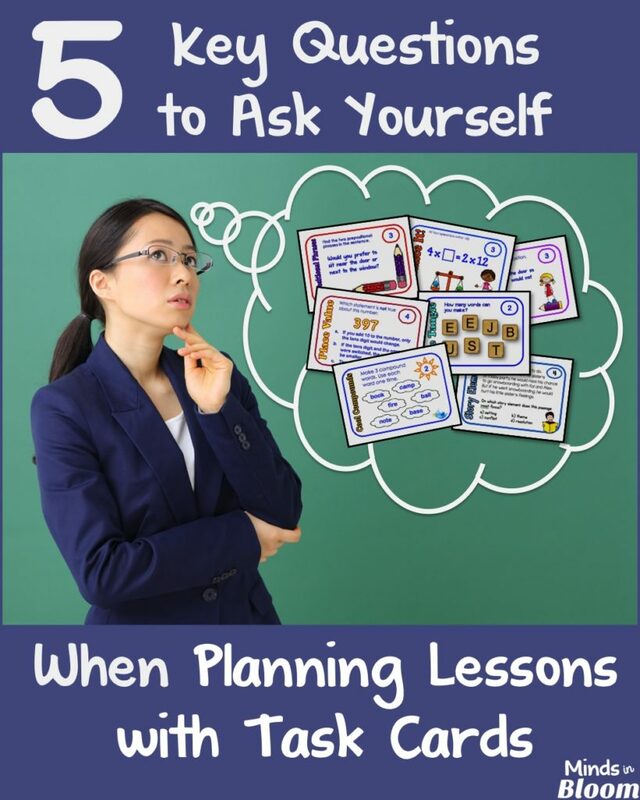 Asking yourself these five key questions will not only result in a more focused and effective lesson but could also prevent unforeseen – not to mention unpleasant – management issues. 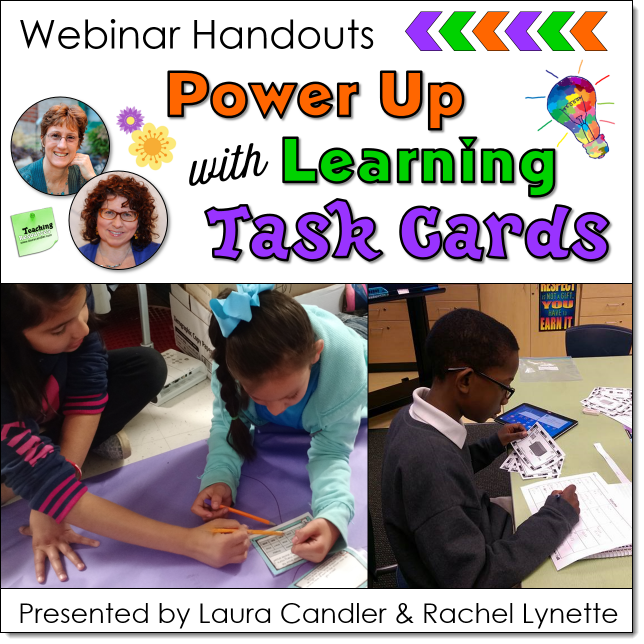 I will be sharing more about using task cards in the Power Up Learning with Task Cards webinar that I am presenting with Laura Candler on Monday, September 12th! Seems obvious right? Of course, you always have an objective or a standard to meet, but it can help to drill down a little more into the specific reason for the lesson. Do you want your students to practice a skill you just taught? Do you want to review something they learned earlier in the year to prepare for a test? 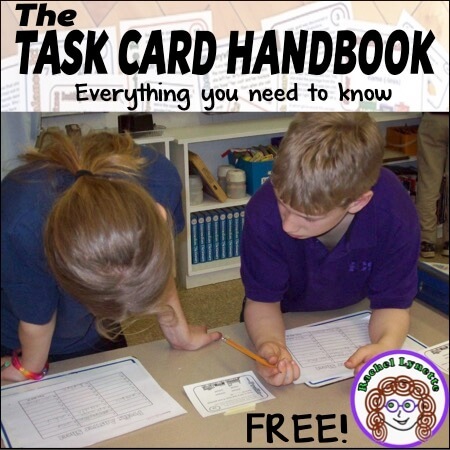 Do you want to use task cards for assessment and, if so, what kind? 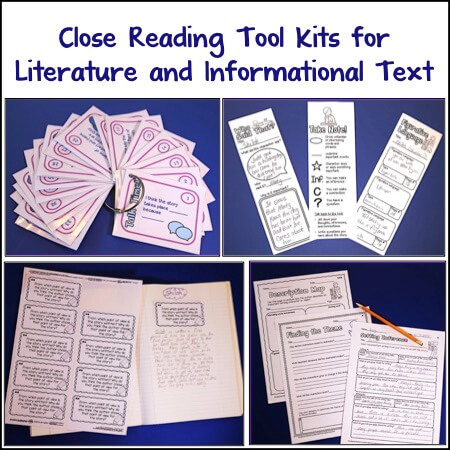 Are you trying to get your students to dig a little deeper into a topic they have been working on for a while? Multiple choice cards may be just what you need for test prep, but if you are digging a little deeper, writing/discussion prompts are likely a better choice. Will you be working with your whole class at one time or dividing them into groups or pairs? Perhaps you are considering using task cards as an independent activity or assigning an adult volunteer to work with groups or individuals. 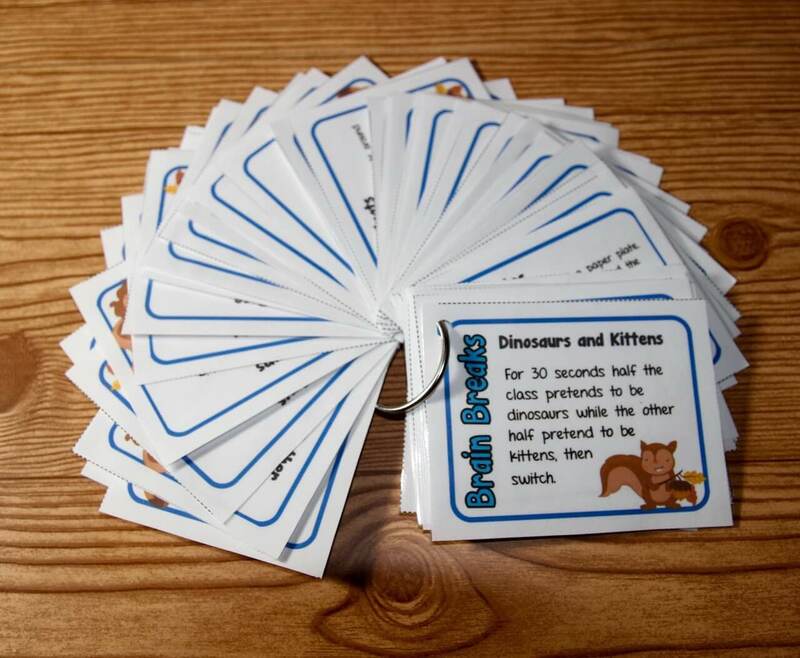 Short answer cards often work well with pairs, since they can collaborate and discuss their answers, while multiple choice cards are great for class games. 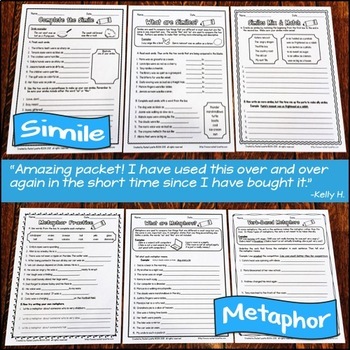 Discussion prompts are ideal in small groups or can be used individually as writing prompts. One of the things I love most about task cards is that they work so well for activities involving movement! Kids love games like Quiz, Quiz, Trade or any activity that requires them to move from card to card or place to place. If you are at a school where students don’t get much time for recess, or if you have some especially wiggly kids, incorporating movement can make a world of difference! However, sometimes you want students to stay at their seats or at a station or center. Most likely, you want to stay in one place when having a class or group discussion, but when doing test prep, why not get those kids moving? Sometimes you really need that answer sheet. Maybe your administration requires it. Maybe you need it for your own records. Other times, you may not need a record of responses – the activity itself may be enough. For example, students practice their math facts over and over, but you don’t need a written record of every time a student multiplies 5 x 6. Using task cards with informal games won’t get you a written response, but it will get your students plenty of practice. Even if you don’t need a written record, your students will still need feedback on their responses. 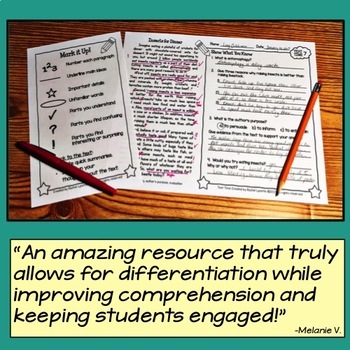 If you are doing a whole-class activity, then you might be using whiteboards or Plickers to quickly check student responses. Your activity may involve students checking each other, or you may utilize a parent helper for that task. If your students are recording their answers on paper, then you may want to allow them access to the answer key to self-check or have them turn in their papers for you or a helper to correct later. Even if your activity is open-ended or discussion-based, you will want some system to make sure everyone is on board and participating. Want to get even more from your task cards? 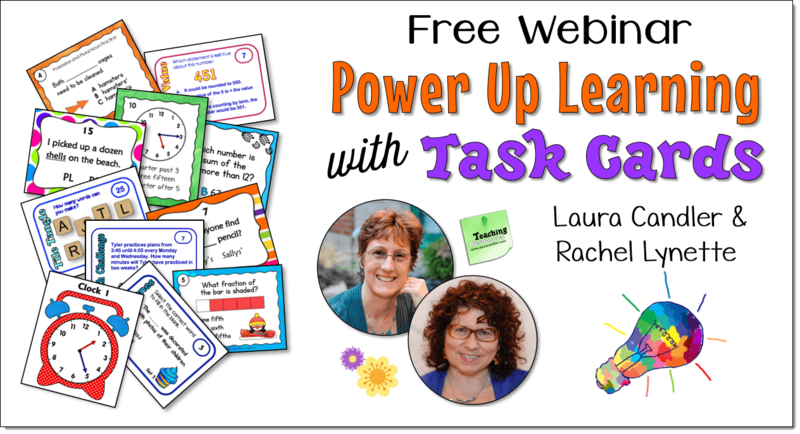 Then register for our free Power Up Learning with Task Cards webinar. 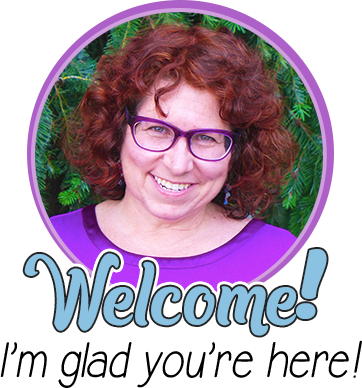 I am so thrilled to be co-presenting this webinar with the always amazing Laura Candler. In this jam-packed webinar, we will explore strategies for upping the rigor in your task card lessons while still keeping them fun for your students. 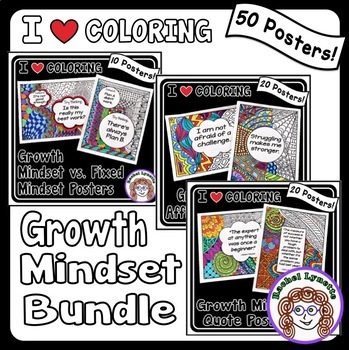 You’ll come away with a ton of ideas that you can use with your students right away! In addition, participants will be eligible for exclusives savings on two special task card bundles. I loved it all! I would say my ah-ha moment was using task cards in commercial games and the cooperative learning strategies! I follow you both and use many of your resources! I can’t wait to start implementing the new info I learned and get all my team teachers using task cards! Thank you SO much!!! I really enjoyed this webinar!! I’ve been using task cards for years, so I thought I knew it all – boy was I wrong. lol So many great strategies, and the Freebies – was a great bonus!! I loved the Lightning Round, as well as all of Laura’s cooperative learning strategies! 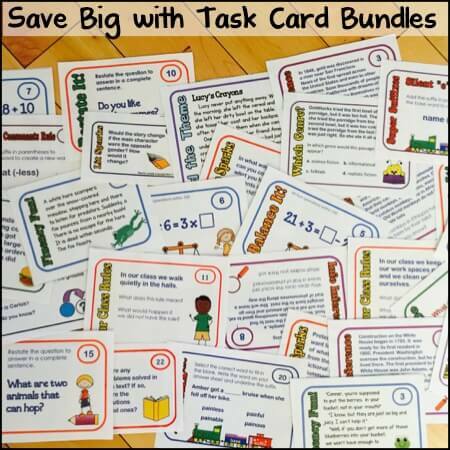 I can’t wait to utilize task cards more in my reading and math workshops next year!! Thank you, ladies, for taking the time to share your expertise with us! I love the fact that I got sooo many ideas to use as fun assessments. 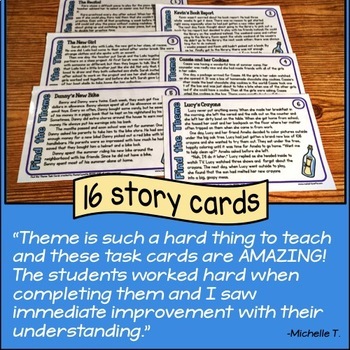 I have never used task cards before, but am excited about not only buying them but also making some this summer. I wish I had known about them years ago! 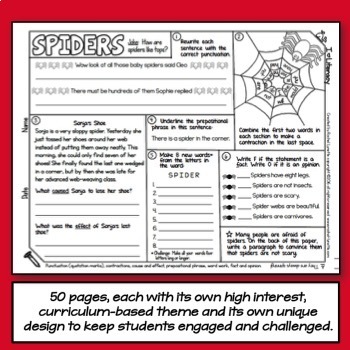 Download the handouts for a little sneak peek. Space is limited, so register now.